Wooden construction with clockwork outboard motor. 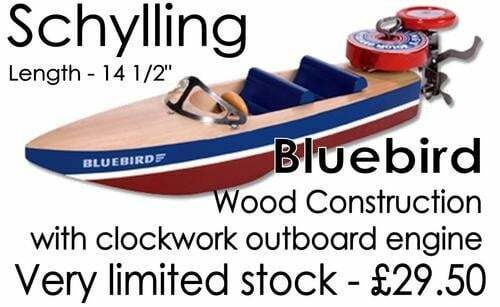 With its solid wood body and tin outboard motor the Bluebird Speed Boat is a unique model boat. This red, white, and blue model is a stunning replica of a traditional 1920's outboard speed boat. Type: Wooden Boat with Wind-up, clockwork Engine.